All thunderstorms are dangerous. Every thunderstorm produces lighting. In the United States, an average of 300 people are injured and 80 people are killed each year by lightning. Although most lightning victims survive, people struck by lightning often report a variety of long-term, debilitating symptoms. 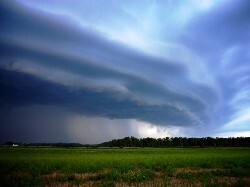 Other associated dangers of thunderstorms include tornadoes, strong winds, hail, and flash flooding. Flash flooding is responsible for more fatalities – more than 140 annually – than any other thunderstorm-associated hazard. About 10 percent of thunderstorms are classified as severe – one that produces hail at least three-quarters of an inch in diameter, has winds of 58 miles per hour or higher, or produces a tornado. “Heat Lightning” is actually lightning from a thunderstorm too far way for thunder to be heard; however the storm may be moving in your direction. Lightning results from the buildup and discharge of electrical energy between positively and negatively charges areas. Rising and descending air within a thunderstorm separates these positive and negative charges. Water and ice particles also affect charge distribution. A cloud-to-ground lightning strike begins as an invisible channel of electrically charged air moving from the cloud toward the ground. 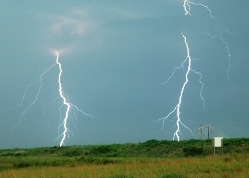 When one channel nears an object on the ground, a powerful surge of electricity from the ground moves upward to the clouds and produces the visible lightning strike. Watch: Thunderstorms are most likely to develop on spring or summer days, but can occur year round. As the sun heats the air, pockets of warmer air start to rise and cumulus clouds form. Continued heating can cause these clouds to grow vertically into towering cumulus clouds, often the first sign of a developing thunderstorm. Seek Shelter: Lightning can strike as far as 10 miles from an area where it is raining. That’s about the distance you can hear thunder. If you hear thunder, you are within striking distance. Seek safe shelter immediately. Minimize the Risk: Most lightning deaths and injuries occur in the summer when organized outdoor sports activities take place. Coaches, camp counselors and other adults must stop activities at the first roar of thunder to ensure everyone time to get to a large building or enclosed vehicle. Things to Avoid: If you are in a building, stay off corded phones, computers and other electrical equipment that put you in direct contact with electricity. Stay away from pools, indoor our outdoor, tubs, showers and other plumbing. Buy surge suppressors for key equipment. Install ground fault protectors on circuits near water or outdoors. When inside, wait 30 minutes after the last strike before going out again. Helping a Lightning Strike Victim: If a person is struck by lightning, call 911 and get medical care immediately. You are in no danger helping a lightning victim. The charge will not affect you. Summary: With common sense, you can greatly increase your safety and the safety of those you are with. At the first clap of thunder, go to a large building or fully enclosed vehicle and wait 30 minutes after the last clap of thunder to go back outside. You can increase the chances that your pet will survive a storm by following a few simple steps: (1) Bring your pets inside – if it is not safe for you outside, it is not safe for them. 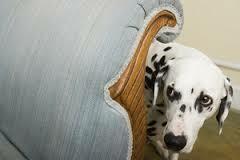 (2) Keep emergency pet supplies where it is easy to find and transport, in case you need to evacuate. (3) Make sure your cat or dog is wearing a collar and identification – this will increase the chances of being reunited with a lost pet. (4) Provide a crate that is easily transported. (5) The important thing to remember is to be gentle, calm and patient with your pets – close the blinds, play calming music and stay with your pet. Myth: If it is not raining, then there is no danger of lightning. Truth: Lightning often strikes outside of heavy rain and may occur as far as 10 miles away from any rainfall. Truth: Lightning can strike any location more than once. In fact, given enough time, it is actually inevitable. It may take as little as less than ten minutes within a single thunderstorm, or longer than a million years, but lightning will eventually strike the same spot again and again. Truth: Rubber-soled shoes and rubber tires provide NO protection from lightning. The steel frame of a hard-topped vehicle provides increased protection if you are not touching metal. Although you may be injured if lightning strikes your car, you are much safer inside a vehicle than outside. Truth: Lightning-strike victims carry no electrical charge and should be attended to immediately. 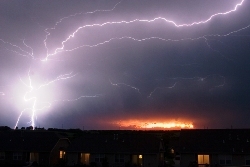 Truth: “Heat lightning” is a term used to describe lightning from a thunderstorm too far away for thunder to be heard. All lightning poses a threat. Are You Ready for a Thunderstorm (PDF, 154KB) – provided by American Red Cross, NOAA, and Federal Emergency Management Agency (FEMA).